The PRIMER represents the water dispersed granules made by an extrusion method. They are well dissolved in water and do not form dust. The new formulyation allows to dose precisely medicine by means of a special measured glass. The PRIMER is packed into 100 gram plastic jars supplied with measured glasses. As well as others of sulphonylurea, the PRIMER blocks the enzyme to an atsetolaktatsintaz participating in synthesis of irreplaceable amino acids. Suppression of enzyme leads to a bystry stop of growth of sensitive plants, and then and to their death. This enzyme is absent in a human body and animals, than low toxicity for warm-blooded, and also for honey bees, fishes and other types of wild fauna speaks. The PRIMER is absorbed through leaves and roots and further easily moves in weeds. At sensitive types growth stops in several hours after processing. Other symptoms as hloroz and a necrosis, appear usually in 5 - 10 days, and full death occurs in 15 - 25 days. Less sensitive weeds can survive and remain green, however they do not compete with cultural plants any more. The PRIMER is brought land spraying with norm of introduction of working solution of 200-300 l/hectare or an aviation way, by 50-100 l/hectare. At preparation of tank mixes with other pesticides dissolve the PRIMER in the beginning, then add other pesticide. Use working solution within a day. The PRIMER is compatible to the majority of pesticides and liquid fertilizers. Nevertheless, in concrete cases it is recommended to check its compatibility with the corresponding product. Tank mix 6 - 8 g/hectare of herbicide and 350 g/hectare of of century of 2,4-D or 75 g/hectare of dicamba increases efficiency of medicine against the outgrown weeds and Mari white, expands an action range. The PRIMER can be applied to control of cereal weeds in tank mix with the corresponding registered graminitsida in a full dose. The PRIMER can be applied in tank mixes with the insecticides and fungicides registered on grain crops. It is not recommended to mix only with fosfororganichesky insecticides because of risk of damage of culture. PRIMER - herbicide for winter (wheat, barley) and summer (wheat, barley, oats) grain crops. There are no restrictions on grades. The optimum consumption rate makes 8 - 10 g of medicine on hectare. Crops process once, in a culture kushcheniye phase. For fight against late ascended weeds it is possible to bring medicine at a culture exit stage in a tube. Winter process in the spring at air temperature from 5 to 25 °C. The majority of weeds most effectively is suppressed when processing on stages of 2-4 leaves, bodyak and sow-thistles in a socket phase. Introduction at later stage can give weaker effect; some weeds at the same time are not destroyed but only stop in growth. The PRIMER cannot be applied if plants wet from dew or a rain and also if within 3 hours after processing the rain is expected. When processing avoid overlappings and demolition of solution of herbicide on adjacent crops. 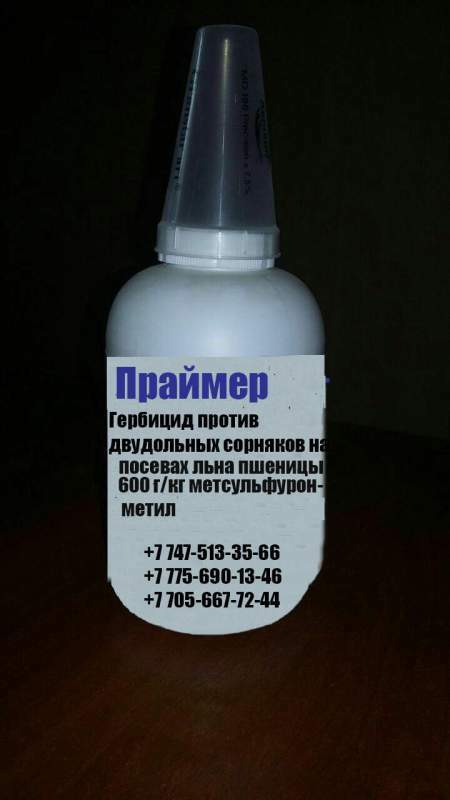 It is necessary to wash out carefully a sprayer after completion of processing as the small amounts of medicine which remained in it can do harm at the subsequent spraying of other cultures. At observance of regulations of application and recommendations the PRIMER provides exclusively high control of sensitive weeds. The complaints of users on effect of medicine can be reviewed by the producer only in the presence of an empty original container on all area of application and within three weeks after processing. The next year after application it is impossible to sow beet and vegetables. The buckwheat and sunflower can be sowed only after deep plowing. On alkaline soils with rn more than 7,5 it is not recommended to sow the next year two-submultiple cultures, especially in droughty conditions. Having changed the culture processed by herbicide the PRIMER it is necessary to carry out only summer grain.